A ribbon-cutting, a confetti-blasting cannon and the usual show of dignitaries greeted the opening of a new light-rail line connecting downtown Los Angeles with East L.A. last year. But no one really talked about the effects that Eastside Extension would have on the community it was splitting down the middle — so Steve Saldivar decided to take a closer look. “The train cuts right through the belly of East L.A.,” says Saldivar, who grew up there and still calls it home even though his parents have moved to the suburbs. Calling on his skills as a photojournalist, honed at Berkeley, he headed south with his camera. “I’m trying to find out — if you build this thing, what does it mean? Does it affect the community in a good way or in a bad way?” Saldivar says. Documenting the effects of the new rail line started as a project for the master’s degree Saldivar will earn this spring from the Graduate School of Journalism. His proposal to take the project deeper won him Berkeley’s 2010 Dorothea Lange Fellowship, which comes with a $4,000 grant. In his proposal, Saldivar pointed out that the rail line not only makes it easier for the people of East L.A. to reach more affluent parts of the metropolitan area but also opens the way for other Angelenos to visit a barrio they may have only sketchy ideas about. “Not only is it taking a community out, it is bringing new communities in,” he wrote. “What does it mean to be a woman in one culture and a girl in another?” his essay asks. His photos — the ones shown here plus more — are part of the book American Identity published by one of Saldivar’s journalism classes. Saldivar, whose parents are natives of Zacatecas, Mexico, says that when he started the Quinceañera story, he thought about his sisters. “One sister had a huge Quinceañera — and she hated it,” he says. To capture the images in his essay, Saldivar went to four Quinceañeras in Oakland’s Fruitvale and San Francisco’s Mission, sometimes staking out churches to find them. He talked with the girls. “I would ask them ‘What does it mean? and they wouldn’t really know. They’re just 15!” he says. After one church service, the celebrating teen and her friends piled into a Hummer limo for the ride to the reception and stopped at McDonalds for fries and Big Macs on the way — a crosscultural moment Saldivar seized to help tell his story. By then, he says, he knew he wanted to be a journalist, but needed training. So he came back to Berkeley in 2008. The graduate journalism program, he says, taught him much more than just writing stories. He covered San Francisco’s Mission for missionloc@l, one of the J School’s hyperlocal news websites. And he came to focus on photojournalism as his career. Saldivar kept on eye on what was going on back home, and news of the new rail line caught his attention. “It seemed like my home is in sort of a renaissance period. I felt I needed to go back,” Saldivar says. His new photography skills let him go home and tell the story in a way he couldn’t have before. 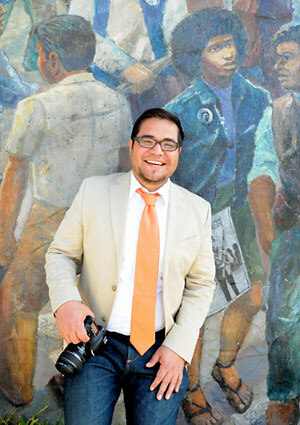 View Saldivar’s winning project proposal on the Dorothea Lange Fellowship site.